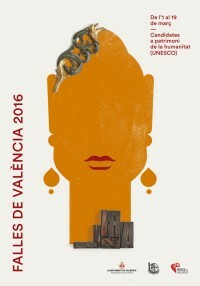 With March starts the Big Fiesta of Valencia, The Fallas. Cardboard, wood, cork , powder , color, music, noise and fire, a lot of fire… these are some ingredients. During these weeks we are going to review various aspects of these that so interesting are for the foreigners. We begin with its history. March is synonymous of celebration in Valencia city and province, and also in some other scattered populations held every one the Fallas, the largest festival of Valencia, which coincides with the name day of St. Joseph, Father’s Day at a general level in Spain and elsewhere in the world. In Ausias March school we take advantage of these dates to imbue young students of the essence of this land. The Tomatina in Buñol has recently acquired interest abroad thanks to its viral component, rapid digestion and funny pictures, but if there’s a game that highlights the uniqueness of the Valencia those are the Fallas, with variations and respective character that can be found in the ‘Magdalena de Castellón’ (February 27 to March 6) and the ‘ Hogueras de San Juan’ (from 20 to 24 June ) . The Fallas -which are always held from 15 to 19 March– have been declared Fiestas of International Tourist Interest of Spain and now fighting to get into the consideration of Intangible Heritage granted by UNESCO. Its origin dates back to the late eighteenth century, when the first records come over bonfires that were made in the street around the day of St. Joseph, patron of carpenters’ guild. Initially were groups of neighbors who drew lumber, and remains the work of artisans and workshops cleaning and prior to the arrival of spring. In that time they stood still very close to the houses, near the front and municipal regulations were regulating the growing installation of these early ‘fallas’ that were already taking shape with the ‘ninots’ (dolls in Valencian) that were part of scenes which told something else, usually stories of the neighborhood, satires of what was happening in the surround. At first the ‘ninots’ were stuffed with straw, old clothes and wore cardboard masks on the face, but in the nineteenth century happen to be made ​​of wax. At the end of the century also the Fallas monuments begin to be accompanied by literature, seasoned with verses and scenes as ‘llibrets‘ that each local group prepares to present his creation. A mid-nineteenth century and five ‘fallas’ were planted, by the end of the century reached more than a dozen. From those first fallas only two remain active, those of the Santa Cruz square and the Negrito, both in the neighborhood of El Carmen, which was a very populated area at the time and territory of craftsmen. 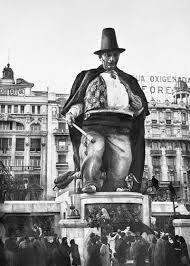 With the increase in fees and faults the City was imposing more regulations with paying taxes and the obligation to submit a preliminary sketch of the monument and try to control the popular celebrations of the city -also it happened to the Carnavales-. Satires that have always been a hallmark of the Fallas by then transcended stories each neighborhood and picked on politicians and their actions. 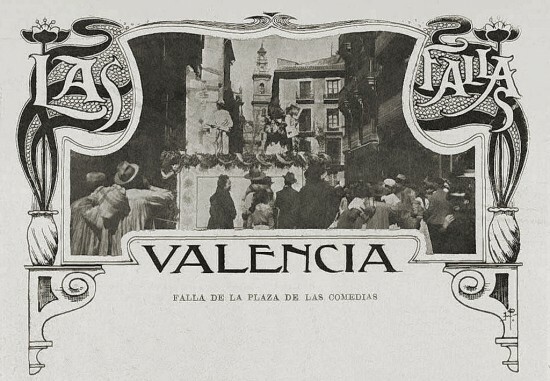 In 1901 the Town Hall began to award prizes to assess the artistic nature of the works which gave necessary nexus between the union movement and local authorities and was a step forward to convert the Fallas in Valencia quintessential party .